This Week in Football History: Rivaldo takes a tumble against Turkey. Brazilian legend Rivaldo is experiencing no pain whatsoever in this picture. "But as is so often the case with the legends of the game, they have one moment of infamy that stands in memory above the rest. Of course, this moment doesn't overshadow his career in the slightest, but for a certain demographic of football fans the name Rivaldo is associated with one moment near the end of Brazil's first group game with Turkey on June 3, 2002." June 3, 2002 - Brazil 2-1 Turkey. Munsu Cup Stadium, Ulsan, South Korea. I loved the 2002 World Cup. Granted it was the first World Cup that I was old enough to properly enjoy and fully remember, but there was some cracking football played at that tournament, along with a boat load of controversy. Call me a cynic, but the best World Cups are those laden with the most on-field controversy, and the 2002 World Cup in South Korea and Japan delivered more than enough for multiple tournaments. There was South Korea, who have perhaps unfairly been labelled as match-fixing villains for their somewhat dodgy run to the semi-finals, after all if Christian Vieri had scored the easiest chance of the whole tournament no-one would be crying foul play. FIFA had tweaked the rules just before the tournament so that any tackle from behind was deemed a bookable offense, regardless of the severity or lack thereof of the challenge, and thus the referee's were allowed to have no discretion on such matters. This rule backfired in a binge of violence in the last game of Group E between Cameroon and Germany, which saw a then record total of 16 yellow cards and two reds dished out by referee Antonio Lopez Nieto, including a yellow for Michael Ballack which would come back to haunt him as it led to him being suspended from the final two weeks later. Reigning champions France meanwhile were sent packing without even scoring a goal thanks to a highly contentious final group game with Denmark. Senegal progressed only after a 3-3 draw with Uruguay thanks to a heinous dive from El-Hadji Diouf in the box and Italy were crying conspiracy ever since they had two goals disallowed against Mexico in their final group game. It was also the best World Cup for upsets. At the end of the group stage, France, Portugal, Argentina and Croatia had all been sent home, and the USA and Senegal were to make it to the quarter-finals while hosts South Korea and underdogs Turkey made it the last four. England were knocked out after Ronaldinho (who also got sent off in that game) lobbed David Seaman while Ballack and Oliver Kahn heroically dragged a rather poor Germany side all the way to the final. But it was Brazil that were the stars of the show. Their 5-2 victory against Costa Rica in the group is still one of the best games I've ever seen and that front three of Ronaldinho, Rivaldo and Ronaldo were a sight to behold. Ronaldo got all the plaudits - eight goals, including the only two of the final was quite the performance - but it was Rivaldo that made Brazil tick. He was arguably the best outfield player of the tournament, scoring a goal in all of Brazil's first five games, including a ridiculous turn and volley against Belgium in the first knockout round. Rivaldo's career was pretty spectacular too. 380 goals, a Champions League medal, two La Liga titles with Barcelona along with a Copa del Rey and also the best hat-trick of all time. But as is so often the case with the legends of the game, they have one moment of infamy that stands in memory above the rest. Of course, this moment doesn't overshadow his career in the slightest, but for a certain demographic of football fans the name Rivaldo is associated with one moment near the end of Brazil's first group game with Turkey on June 3, 2002. Turkey had played well above themselves and took the lead at the end of the first half when Hasan Sas smashed past Marcos. Within five minutes of the restart Rivaldo had brilliantly set up Ronaldo for the equaliser and with five minutes left Turkish defender Alpay dragged down Ronaldo outside the box but the referee gave a penalty and sent Alpay off. Rivaldo scored the penalty and Brazil had snatched a victory. It was in the last minute of stoppage time however that Rivaldo would leave his mark on an already contentious game. Brazil had a corner and with time ticking down Hakan Unsal toe poked the ball back to Rivaldo. 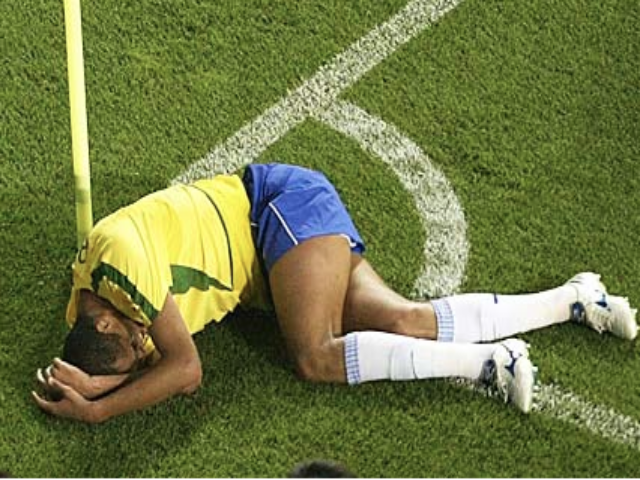 The ball hit Rivaldo rather gently on the thigh, and Rivaldo collapsed holding his face. The referee immediately sent Unsal off and a few moments later Rivaldo was miraculously fine. It was a disgraceful yet wonderfully acted performance from Rivaldo, but what has always annoyed me the most about this incident is that there was utterly no need for it. It was the end of the game, Brazil had already won, there was absolutely no advantage to be gained from feigning an injury. It had no bearing on Brazil's result as the whistle blew just seconds later and Rivaldo seemingly did it for the sole purpose of getting another Turkish player sent off. Looking back on it today, it is a rather funny incident to be fair, surely one of the worst cases of embellishment in football history. A truly great World Cup has equal measure of scandal and glory, and Rivaldo provided more than enough of both in 2002. A BBC documentary in 2006 had a short two minute segment on the Rivaldo incident, which you can see here, complete with Clive Tyldesley's commentary. This Week in Football History: Jock Stein's Lisbon Lions conquer Europe and crush Catenaccio.